There’s no place like Key West for the holidays and there is no shortage of fun holiday events and happenings taking place right in our backyard. Holiday parades by land and sea, with house tours, holiday shows and concerts, bike parades, boat parades, art fairs and holiday shopping!. Tis the season to be jolly and Ho Ho Ho! Here is the Key West Holiday Season Event Lineup. 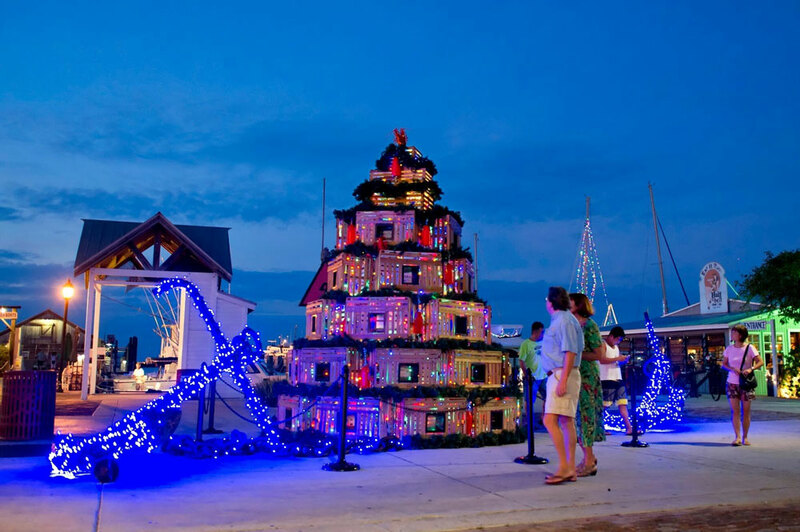 The Holiday Season in Key West kicks off on November 22nd as the Historic Seaport Lights up with the Lighting of the Key West “Harbor Walk of Lights.” Head over to the Harbor Walk at Green and Elizabeth Street to view the official lighting of the 2017 Key West Harbor Walk of Lights. The Harbor Walk of Lights will be lit up every evening through New Year’s Eve! If you want to be part of a hometown local parade then join us for the City of Key West Holiday Parade on Saturday, December 2nd. Marching Bands, floats, school groups, trolleys, cars, bikes all decorated to celebrate the holiday season. This is one of our favorite Key West parades fun for every age. Children sit curbside with open eyes waiting for Santa as well as catching tossed candy from the floats. It all begins at Bayview Park and best viewing spots are along Duval Street and Truman Avenue. Oh what fun!!! Decorate your bike, dress up and join us for the Key West Lighted Bike Ride. The streets of Key West will glow as bikes are lit up to help gather needed toys for the struggling, working families of Key West for the holidays. This is a fun family event beginning with registration and check in at 6 pm - at Bay View Park - and bike ride beginning at 7 pm. Registration for the ride is one unwrapped toy for the Key West Holiday Helpers Toy Store. Join us for a special holiday movie night poolside at The Marker. Bring your friends, wear your bathing suit, and enjoy drink specialss, $5 food plate specials and more while watching “Elf.” We will aslo have holiday photo opportunities with “Bad Santa” Landon Bradbury and Photographer Nick Doll. Come early, have a holiday drink or two and mix and mingle with us during Holiday Movie Night. Deck the hulls as the Key West Historic Seaport and harbor areas are lit up with lighted and decorated vessels from rowboats to tall ships. Welcome to the Schooner Wharf Bar Annual Lighted Boat Parade! The Judges Stand is located at Schooner Bar so why not hang out, grab a drink, enjoy the music and holiday festivities as the boats pass by in paradise. The parade is scheduled to begin at 8 p.m. and there will be festivities beginning at 6pm with live music and holiday happenings all around the Historic Seaport. Local artists come together for a festive island shopping experience! Enjoy cookies and coffee as you stroll through a friendly, festive indoor market. Over 20 artisans present unique and locally produced gifts: jewelry, textiles, home accessories and quality crafts. From 9 a.m. to 2 p.m., Studios of Key West, 533 Eaton Street. Attend a Holiday Play at the Waterfront Playhouse! Grab a large helping of holiday cheer with this hilarious, madcap comedy! It's a cross between A Christmas Carol and Noises Off. Behind the scenes of a struggling theatre's annual slapdash production of A Christmas Carol, rehearsals are at a standstill. Tim is no longer Tiny, Scrooge wants to do the play in Spanish (Feliz Navidad), and their funding is on hold pending an inspection. This laugh out loud spoof makes for a night at the theatre that is anything but show business as usual. "Inspecting Carol" is a delightful mix of "A Christmas Carol," "Noises Off," "Waiting for Guffman." Head over to the Key West Theater for a holiday burlesque nutcracker! Put on your stockings and pull out your sugarplums for Key West Burlesque's "Sugar Rum Cherry: A Burlesque Nutcracker." This naughty holiday 2-act reverie features your favorite local performers, international burlesque superstars, and amazing aerial acrobats as they visit the land of libations. Doors open at 7:30 p.m., show starts at 8:00 p.m. Performance at Key West Theater, 512 Eaton Street. This is your opportunity to tour festively dressed Key West homes and gardens. If you have a chance attend the Old Island Restoration Foundations 58th Annual Key West House & Garden Tours. They are self guided tours taking place from 3pm-7 p.m. each day. Tickets are $30 in advance, $35 day-of-tour. Proceeds benefit the foundation's museum and programs. Frost-free Key West becomes a "wiener wonderland" when about 200 dachshunds and their owners take a noontime New Year's Eve stroll through the island's picturesque downtown. This is another fun quirky parade with our pups as the stars of the show. Spectators can watch the fun and meet the canine participants on Fleming Street between Whitehead and Duval streets. Decisions. Decisions. 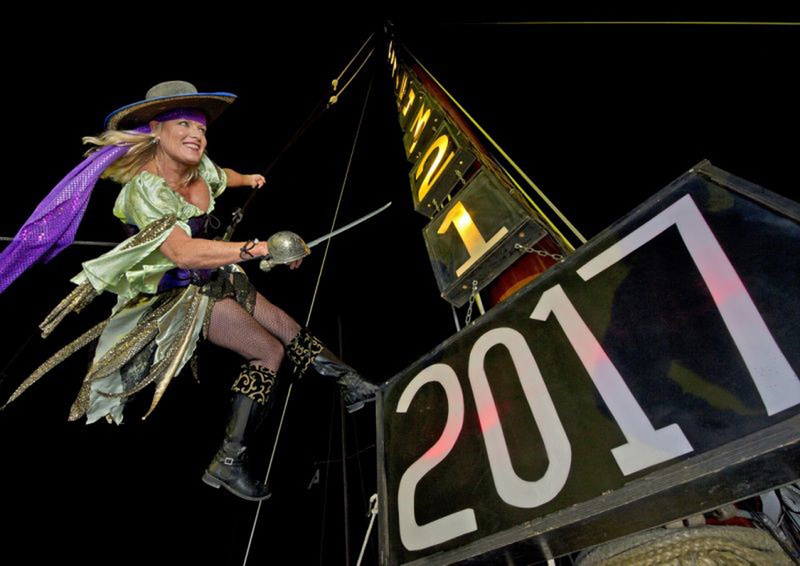 At midnight in Key West you have the opportunity to watch a Conch Shell drop at Sloppy Joe’s Bar, a New Year’s Eve Shoe Drop by Sushi at the Bourbon Street Pub/New Orleans House complex or watch the Lowering of the Wench at Schooner Wharf Bar. So many options on one special night! Wherever you are we wish you a safe and happy holiday season!